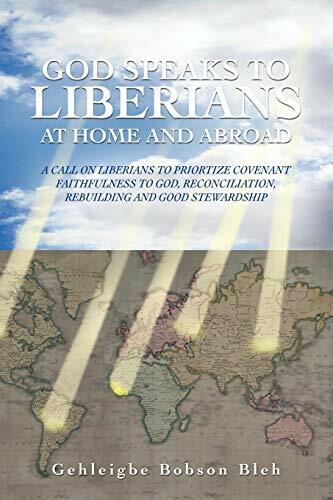 God Speaks to Liberians at Home and Abroad is the Author's call to all Liberians to prioritize covenant faithfulness to God, the rebuilding of Liberia, reconciliation, forgiveness and good stewardship that can lead to total freedom for all Liberians. Liberians at home refers to politicians, civil servants, religious leaders, business people, farmers, community leaders, chiefs, elders, students, etc, who did not leave the country since the emergence of the bloody and senseless war created as the result of power greed. These persons experienced every bit of the war, for they had nowhere to run. Thousands were killed in cold blood at the hand of wicked men and women who claimed to be liberators. Other refuses to die outside their motherland and they cried, "It is better for me to die in my own country than to die in next men country". Liberians Abroad refers to those Liberians who have left the country prior to the civil for the purpose of education, economic prosperity or greener pastures, but failed to help develop Liberia. Some of those Liberians say the worse things about homeland. The next group in this category are those Liberians who were forced to fl ee the country because of the war and found themselves in refugee camps around the world. These are the most hurt people in that they lost their homes, properties, love ones and freedom. It my prayer that as we read and refl ect on the message of the Book of Haggai, you will take consolation in the word of God like the children of Israel, who lived in exile for seventy years. Finally, they returned home and began to rebuild their nation. As we sit by our rivers of Babylon, we should remember Liberia, our Zion, and Sweet Land of liberty.